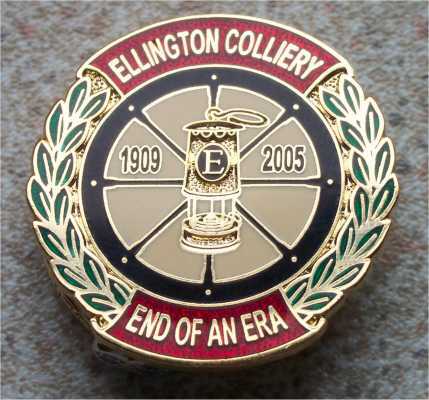 Ellington Colliery (1909-2005) Closure Badge. Ellington Colliery was sunk by the Ashington Coal Company Limited in 1909. It exploited coal seams that ranged far out off the coast of Northumberland under the North Sea. In February 2005 water catastrophically burst out from the coal face of a new development in the mine. This new coal face should have assured at least another five years of life for the pit. The face and all of its equipment was lost. Although pumps were employed for a short time to stop the inundation from flooding the rest of the mine UK Coal deemed the situation economically irretrievable and the colliery was subsequently closed. Ellington, otherwise known locally as the “Big E”, was the last operating deep mine of the Great North Coalfield and as such its closure truly marked the end of a great industrial era not only for the counties of Durham and Northumberland but the UK as a whole. To mark the closure of this mine the GNB Co. have issued a limited edition badge of only 100 issues. Badge Type: High quality hard enamel complete with broach pin attachment; Size: 32 mm; Colour: Red, Black, Gold, Cream & Green; Reverse Side: Engraved on the reverse "The Big "E" / Last Deep Mine of the / Great North Coalfield" plus a unique stamped issue identification number out of a stated total of 100; Number Issued: 100; Launch Date: 9 July 2005; Price: £5.50 inclusive of first class P&P within the UK - SOLD OUT. To reserve your badge e-mail: linda.smith64@virgin.net or telephone 01740 630014.